"These images of our dear friend and native son, Reynolds Price, are precious reminders of a lovely life, fully lived and generously shared with those of us lucky enough to have known him. Every page summons the memory of that indomitable spirit and wry conspiratorial humor. How could he be both compassionate and wicked? It is even good to miss him." "Annie Dillard's famous quotation "How we spend our days is, of course, how we spend our lives" comes to mind as I page through Dream of a House: The Passions and Preoccupations of Reynolds Price—a gorgeous, fascinating, and inspiring look into the life, mind, and heart of beloved writer Reynolds Price. 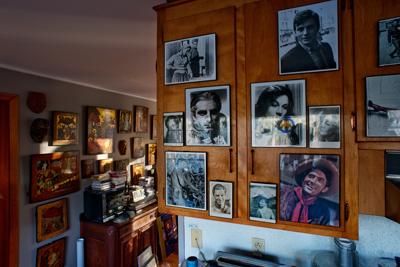 This is a completely original concept—a biography told through interior photographs of the house Price lived in for forty-six years, literally every inch of it occupied by the art he loved—books, paintings, recordings, films, sculpture, sketches and photographs of friends and people he admired or loved (Buddha, Abraham Lincoln, Leontyne Price, Eudora Welty, Jesus Christ, and James Dean, for instance) artifacts of a passionate life fully lived despite the paralysis which confined Price to a wheelchair for his last twenty-seven years. Each photograph is brilliantly paired with a wonderful quotation from Price's own voluminous writing, making this unique volume one of the most meaningful and inspirational books about writing and art—and overcoming adversity—ever published. A moving answer to the perennial question, "What is the purpose of art? ", Dream of a House is a treasure for every artist, aesthete, reader, or writer. Kudos to Price's good friends Alex Harris and Margaret Sartor for their rigorous choices and their own fine writing about their good friend." "Reynolds Price was my friend for fifty years. We were from the same place and would, in our own ways, journey far from eastern North Carolina to the capitals of the world. He had so many talents as a writer, cultural figure, teacher, and role model. With Dream of a House, what we now have is a look inside his personal world. We can see what he chose and what he valued and what reinforced him. And we can see the connections between those things. 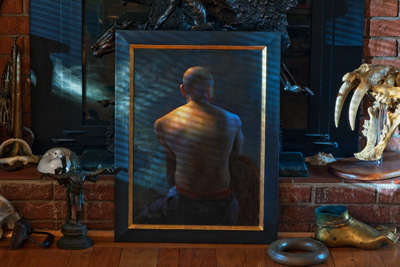 Alex Harris and Margaret Sartor help us to see the man in a wider light and to appreciate a huge idea—that is, the connection between the exterior and interior life, between what we know and what we had not known before." "This is a beautiful and moving book. I know Reynolds would be proud." "I have never had the privilege of witnessing such artistic care and grace taken in the name of another man's journey, legacy, triumph, tragedy, and all that lies in between—truly fit for the king Reynolds was and for the kingdoms Reynolds's words will eternally build." "A writer's home is the familiar place where their deepest spirits reside, where they craft their creative work. Dream of a House: The Passions and Preoccupations of Reynolds Price is a moving homage to Reynolds Price by his friends Alex Harris and Margaret Sartor. Harris's photographs and essay and Sartor's afterword reflect their love for Price as they probe intimate spaces in the writer's home. 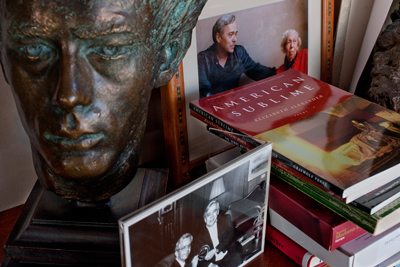 Like both his written and spoken voice, Reynolds Price's house is a richly textured, baroque world, filled with paintings, sculpture, and photographs of people whom he admired, including Eudora Welty, Leontyne Price, and James Dean. By pairing photographs of the home with text from Price's literary works, Harris and Sartor offer a hauntingly beautiful tour of the artistic world that nurtured Reynolds Price. Dream of a House: The Passions and Preoccupations of Reynolds Price is itself a work of art that frames the home, the passion, and the artistry of a truly great writer." "Reynolds Price collected passionately all his life, not as an investor but as a man who loved ideas. It's good that his assembly of thoughtful objects has received this beautiful commemoration. In prose, he defined his emotions as precisely as he could, and his plaster casts and prayer-wreathed icons come with his feelings still surrounding them. They were not decoration. They were looked at. They made his life less of a soliloquy, more of a conversation." "For almost half a century, the great Southern writer Reynolds Price lived in the same house in the Durham, North Carolina, woods. He seems to have filled nearly every available flat surface and hanging wall space with collected pieces of art—high and low. 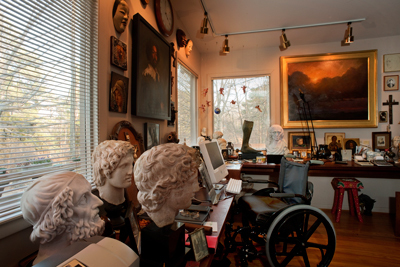 His home was a kind of tactile museum of his large and generous mind. That museum is gone now, but we are fortunate to have a record of it preserved in this beautiful book by two fellow artists, the photographers Alex Harris and Margaret Sartor, who lived nearby and loved him much. In addition, we have Price's own words to help guide us room to room. The book strikes me as something like being able to put on headphones, for this rare exhibit, and then just wandering at will. " "Dream of a House pays tribute to Price; it also awakens the observer to one of Price's own observations." "Harris's book is a beautiful tour of the space in which Price wrote. Eschewing captions or annotations, Harris and his wife, Margaret Sartor, declined to identify the faces of those pictured in the snapshot along Price's walls, or to annotate all the works of art that appear in their book, instead setting the pictures against excerpts from Price's poetry and prose." "The two co-editors of this stunning farewell to Reynolds Price came to know and adore him during the wheelchair era of his long, happy, and very productive life. The title of this exquisite book of photographs and texts, his and theirs, is taken from Price's poem "The Dream of House."